The great deltas of the globe have been threatened for several decades but their decline now appears to be inevitable; they are receding and losing the fertility that supports their tens of millions of inhabitants. Our deltas are victims of the dramatic deterioration in the volume of continental sediment brought by rivers to the oceans. By nature, deltas are fragile eco- and geological organisms. For centuries, they have been subject to human actions in the Mediterranean and European world, and today a deep crisis is affecting the great tropical deltas. A chapter is also devoted to concerns facing the Mississippi, an “aging delta of the new world”. 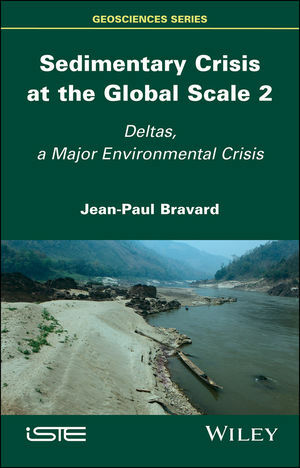 Sedimentary Crisis at the Global Scale 2 discusses possible strategies to protect the deltas of the world – or at least adapt them and their dependencies to the changes they face. Several models are possible, including comprehensive protection (such as in the Netherlands) and cautious and respectful opening to the forces of the oceans in an environment-first perspective. Jean-Paul Bravard is Emeritus Professor of Geography at Lumière University Lyon 2 in France, as well as an honorary member of the Institut Universitaire de France. He has published numerous studies on the Rhône and other rivers.